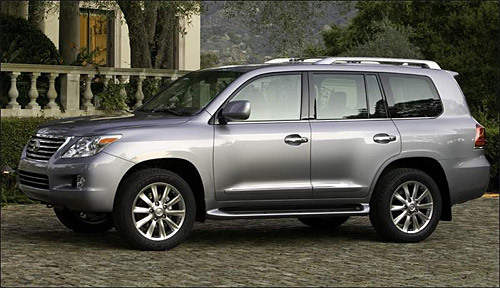 Hey, wait a second, you say, is this just a Land Cruiser with a Lexus badge on it, the way the first ES was way too much of a Camry? Oh, ye of little faith and long memory. No, it’s not. Look at the spec sheet. It has more acronyms than a quartermaster’s RFP–at least 13 standard features not found on the Land Cruiser. “I’m amazed at the technology in this vehicle,” said Lexus chief Mark Templin. Hey, he works there, and he’s amazed! Some are unquestionable assets, such as the VVT-i that controls the dual overhead cams, the acoustic control induction system (ACIS) that tunes the intake runners, the new transmission-fluid temperature control that warms or cools the fluid depending on conditions and active front headrests that reduce neck injuries. Luxury technology abounds, too, including a “sub-cool accelerator system” to get cold air flowing more quickly in the four-zone climate-control system and second-row seat heaters. As I said, a touch too sarcastic, but this is a vehicle that elicits a wide range of reactions. All in all, the preview is positive, going as far as to say this is the vehicle you want to have should civilization ever collapse. Now that’s some heavy praise!